What is Travel Edition Whisky and Why Does it Exist? 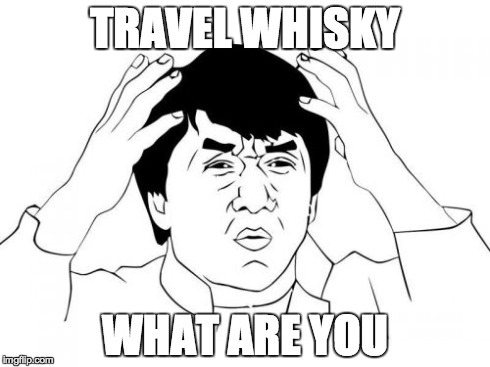 I was reading a PR piece from whisky giant JOHNNIE WALKER™, in this piece they wanted to announce a travel whisky: ” JOHNNIE WALKER® GOLD LABEL RESERVE™ EXCLUSIVE TRAVELLERS’ EDITION”. We know that travellers seek a different shopping experience from domestic in travel retail environments: they are looking for new and unique products from their favourite brands that they can’t get anywhere else – products that mark them out as travellers and serve as a momento of their travels. We are keen to offer differentiated products for the travel retail market as we understand our consumers and know this appeals to them. As a brand with travel as part of its DNA we saw the opportunity to give both our customers and travellers something exclusive that they couldn’t ordinarily buy in domestic retailers. Travel is part of Johnnie Walker’s brand heritage. Johnnie Walker has been a global brand since 1905 and it is one amongst the first of its kind. In the 19th century, travel meant mostly sailing as it was the best means to get our whisky to the world. To quote the 1920s Around the World book: “We sailed wherever ships could sail”. Our bottle structure – the iconic square bottle – was an innovative solution by Alexander Walker in 1860 to avoid breakage in the ship’s hull. The bottle design of JOHNNIE WALKER™ GOLD LABEL RESERVE™ TRAVELLERS’ EXCLUSIVE EDITION has been inspired by travel, celebrating the journeys of our consumers. This is embodied through the prominent world map design. I thought it was a good response, and wanted to share it with everyone in case you ever had the same questions about travel whisky I did. I’m still not sure how I feel about exclusive (using the mean of the word to ‘exclude’) products from any brand, but I do appreciate that people might want “momento of their travels”, and being a bit of a sailor myself, I enjoy the history behind the bottle shape, and the idea of keeping tradition alive.